Norwegian shipowner and industrial tycoon John Fredriksen, long listed as one of the wealthiest men in the world, says he’s working 18 hours a day to save his large offshore rig company Seadrill from bankruptcy. The 72-year-old Fredriksen has faced crises before, and is prepared to “work day and night” for the next several weeks to avert another one. “I have a very tight program and don’t have a minute to lose,” Fredriksen told newspaper Dagens Næringsliv (DN) just after Seadrill’s share price fell nearly 40 percent on Tuesday, on news that it had received an extension on three large loans and that refinancing would result in large losses. Seadrill shares fell another 27.79 percent on the Oslo Stock Exchange Wednesday, to just NOK 6.27 per share. That includes investors who, according to Seadrill chief executive Per Wullf, should have taken the hint in January when “we gave the same message” about how shareholders must expect to be left with “minimal” share value after the restructuring. Seadrill had reported itself shortly after New Year that it would need to seek protection from creditors under Chapter 11 of the US Bankrucpty Code if it didn’t manage to reach an agreement with leders. DN reported that more than 40 banks are involved in the financing of the company, and Seadrill also needs agreements with other lenders as well. Fredriksen and other must also provide new capital for the company. 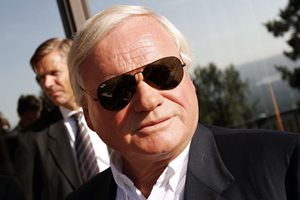 “Seadrill has been badly financed,” Fredriksen told DN. “We haven’t been screwed together to resist such a big fall in the oil price.” Both he and Wulff have criticized Fredriksen’s former right-hand man, Tor Olav Trøim, over his leadership of the company. Others contend Trøim succeeded at many diversification projects that took Fredriksen well beyond his initial tanker ship empire and into other areas of shipping, offshore, salmon farming and even debt collection. Fredriksen’s ownership of Marine Harvest, for example, has made him far richer than he already was, as did the rig expansion during the oil boom years. Trøim left Fredriksen amidst acrimony three years ago and is now doing well on his own.